Friends and fellow anglers, So far the winter of ’04-’05 has been very kind. All watersheds in Northern NM and Southern Colorado are over 100% of the 30 year average and its only the beginning of March. Traditionally our wettest months are March, April and May so the forecast is for adequate water for our finned friends this season. Hopefully this pattern is more than a brief respite from the drought of the past 5 years. Heres my predictions on what to expect this year. The Cimarron should have adequate flows thru June even if they don’t release water from Eagle Nest Lake. The drought drastically reduced levels in Eagle Nest so I expect them to hold back as much water as possible to to build up their storage. Flows from the tributaries below the dam should keep flows between 20-50cfs. thru the Stonefly hatch in June. The Costilla which opens July 1st has had a banner snow year. Reports say that most north facing canyons have up to 6′ of standing snow. Last year releases from Costilla Resevoir were a lot better [ higher weekend flows and lower flows on weekdays ]than at any time in its 20 year history. I expect flows between 40-90cfs thru mid September. Commance Creek may also make a comeback this year. We have a new piece of private water on the lower Costilla also. Sanchez Resevoir above the Culebra was close to empty at the end of last year. Depending on how they manage the water it should be best from early April thru July and then we’ll have to see what the summer rains bring. The Red is its usual self with springs warming the flow and as of now there are caddis, mayflies and little brown stoneflies hatching. Fishing should be great here until runoff which will start in mid April [depending on the weather] and will last into June this year. After runoff the Red fishes well thru November. The Rio Grande will be back to its pre drought condition. If it stays cool thru April we could have a decent caddis hatch. The bugs will be there the only question is the clarity of the water. After runoff starts, fishing on the Rio will be over until September when lower flows and clearer water will usher in the best fishing of the year on the Grande.September and October are the best months here. The Conejos will have significant runoff this year and probably won’t be fishable until late June or early July. Fishing should be great thru October. The Pinnacles should be real good when flows get low enough by late July or early August. 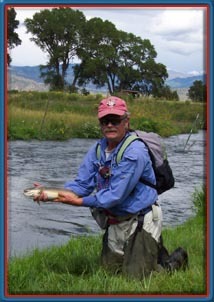 The Embudo, Santa Barbara, Pueblo and Chama will all be fishable after runoff thru September.